8 pages. Volume 4, Number 22, dated December 1, 1978. Newsletter / bulletin originally mailed-out to amusement game operators, providing updated info about the coin-op industry. A great historic insight to the industry of the time. 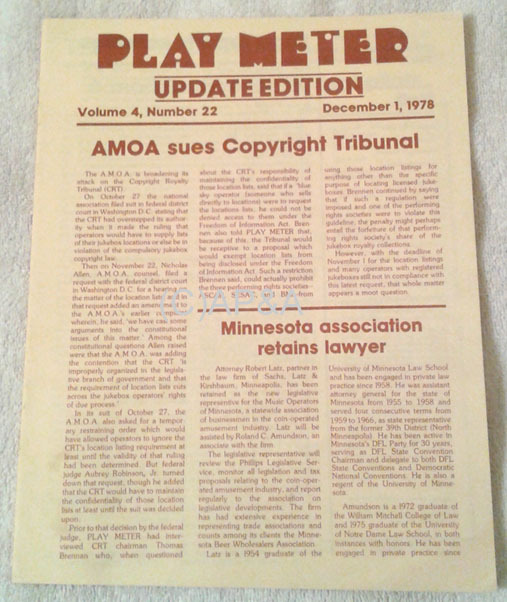 This edition includes information about an AMOA copyright lawsuit, Sega reporting record earnings, juke box updates, tech info and tips, classified ads, and for juke box operators- a listing of the top 75 record/singles- pop, country, and R&B- for the time.